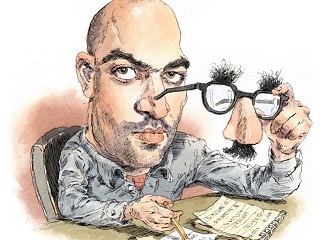 The Atlantic catches up in New York with the celebrated author of Gomorrah and ZeroZeroZero. In 2006, Italian crime journalist Roberto Saviano unleashed Gomorrah, a detailed account of the Italian mafia in Naples. Next month, the English translation of his follow-up book ZeroZeroZero arrives. This one is all about the Mexican and Colombian drug cartels that control the international cocaine trade. Italian authorities, working with the NYPD and the FBI, have established strict rules for Saviano’s life in New York. He has a midnight curfew and a mandate to stay in the state unless he gets permission to leave. Every time he lands at JFK, he is detained – sometimes for hours – until the authorities clear his entry. His wallet reveals various fake identities. At one point in our conversation, he fished from his pocket an old ID from New York University (where he’d taught a course in 2011 on the organized-crime economy) and passed it to me, chuckling. A photo of a dour and very Mediterranean-looking Saviano sat incongruously above a name more fit for a British parliamentarian: David Dannon. When he returned to the U.S. last fall, he was issued a new ID – this one with a three-part Spanish name. “It’s better than Dannon,” he said. ZeroZeroZero, like Gomorrah, was translated into English by Virginia Jewiss. She holds a PhD in Italian literature from Yale University; for her Alma mater’s most recent spring term, she led students – from her home base in Rome – through an interdisciplinary study of the city.